A smooth textured blue cheese with a rich, rounded flavour and distinctive blue veining through the russet interior. Despite its name, Shropshire Blue originated in Scotland and is generally made now in Leicestershire, Nottinghamshire or Derbyshire. There is a lack of a convincing explanation for the name of this cheese because as far as can be ascertained, the product has never been made in Shropshire. Our Shropshire Blue is made by Cropwell Bishop, a family run creamery in Nottinghamshire. To make Shropshire Blue, evening and morning milk are blended together and a starter culture is added, along with vegetarian rennet and the blue mould culture, penicillium roqueforti. The curds form and the whey is drained off before the curds are transferred from the vat to the 'table' where they are left to settle overnight. The following day they are milled, salted and transferred by hand into cylindrical moulds.This is the stage when the cheeses begin to form and after a week in the moulds they are removed and the rind is smoothed down. They spend a further four weeks in the ripening room before being pierced with stainless steel needles whereby air can reach the interior of the cheese and encourage the spread of the blue moulds and the characteristic blue veining. The cheeses can then be kept until the desired maturity is reached. 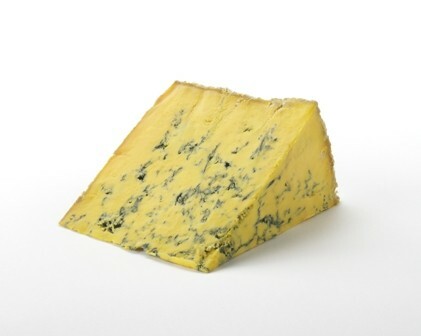 Shropshire Blue is a distinctive looking cheese that is not dissimilar in taste to Stilton, although firmer in texture. The cheese has a warm russet colour to it from the addition of the natural colorant, annatto, which contrasts nicely with the dense blue veining that is found throughout the cheese. Shropshire Blue is an excellent cheese on a cheeseboard because of its distinctive colour and mellow, blue taste. It can also be blended with cognac into a rough paste and then mixed into minced meat for a delicious twist to meatballs or burgers. Shropshire Blue was awarded Supreme Champion at the 2016 British Cheese Awards. Shropshire was also awarded Best English and Best Blue cheese at the 2016 British Cheese Awards.